A linguistics scholar glances at the history of the English language and takes on some contentious contemporary issues—from “fewer” and “less” to the relationship between language and social status. Horobin (English Language and Literature/Univ. of Oxford; Does Spelling Matter?, 2013, etc.) 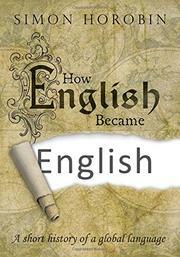 takes us swiftly through the history of the English language, occasionally slowing to point out some engaging phenomena. Throughout his text are some informative, and often amusing, graphics that illustrate and elaborate on his points (Calvin and Hobbes make an appearance). Horobin certainly attends to the geography and maps of his journey, reminding us about the earliest ancestors of English—with an interesting argument that perhaps Old English is so different from Modern English that it ought to be considered a separate language—about the English tendency to borrow from other languages, and about our enduring fondness for creating words (one of the most enjoyable is “adorkable”: socially clumsy but charming). The author also teaches us about the evolution of dictionaries, grammar and usage guides, of the effects of social media, and of the association of “correct” usage with status—a fact quite evident today: see Facebook memes, Twitter wars, indignant op-ed pieces, and usage manuals. The author continually reminds us that “correctness” and preferred usage did not come down the mountain with Moses. Printers and others often invented them—sometimes fairly recently—and usage continuously changes. Horobin believes that teaching standard English remains important and, illustrating his own point, invariably uses “comprise” and “disinterested” in the correct manner. Near the end, he sketches some differences among the varieties of English in regions around the world. A tacit message throughout for speakers and writers of English: relax. Things have always changed, and they will continue to do so. A happy mixture of scholarship, clear writing, and humor.